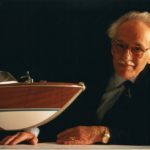 The Riva shipyards, the Ferretti Group and the entire world of yachting are grieving over the loss of an unrivalled creator of boats, a master of style and elegance. An extraordinary man who turned his family name into a legend and a brand into a synonym of yachting itself. Just four letters epitomize the history, the legend, the technology and the appeal of Italian made yachts. The history of a family and of an extraordinary man, the legend of a whole era that saw the launching of Italian design onto the world stage, from the days of “La Dolce Vita” through to the present day. Mr. Riva was not just one of the most internationally esteemed and renowned entrepreneurs in the pleasure craft industry. His innovations and creations have left an indelible mark in the history of lifestyle and design, making Riva the most famous boatyard of all times and a symbol of Italy’s productiveness and creative genius. Carlo is the creator of Riva’s golden age, the Master shipbuilder who transformed the brand and its boats into a status symbol, thanks to models like Ariston, Tritone, Sebino and Florida, through to the “legendary” Aquarama, unveiled in 1962. These boats became the objects of desire for aristocrats, actors, sporting champions, businessmen and all kinds of celebrities. They notably included Sophia Loren, Brigitte Bardot, Liz Taylor, Sean Connery, Jean Paul Belmondo, Richard Burton and Jackie Stewart, to name a few. As well as royalty, princes and sheiks from every corner of the world. In the 50s and 60s, during Italy’s industrial reconstruction and “economic miracle” driven by a fascination for speed and racing cars, Carlo Riva grasped the spirit of the age and created boats in wood with an unmistakable design. These nautical masterpieces immediately distinguished themselves for the fine materials, meticulous attention to detail and craftsmanship with which they were created. Carlo Riva showed entrepreneurial foresight yet again in 1969, when he created the first fibreglass boat, demonstrating his great capacity for innovation while at the same time preserving traditional values. His unique and inexhaustible entrepreneurial spirit comes through not just from the boats he made but also from his ability to predict needs and opportunities. Anticipating the needs of yacht owners he in fact designed the Riva Boat Service, to provide technical and sales assistance. Having left the shipyard in 1972, the focus of his interests shifted to the International Tourist Port of Rapallo, which was dedicated to him on 25 July 1975 and bears his name since that day. In 2005, in Monaco, his “best-loved home” on the French Riviera, Carlo Riva was conferred the title of “Personnalité de la Mer” by Prince Albert II of Monaco. Carlo Riva has always been there to give advice, help and support to the Riva Boatyards: it is with great emotion that we remember his presence last spring at the launch of Rivamare, the latest masterpiece from the Sarnico boatyards.